"At Derby College I was taught a lot of skills such as target setting that has helped me be organised and realistic with work and learning." Ryan was involved with First Response Finance as part of their work with Derby College’s Employer and Skills Academy and applied for an apprenticeship. The company is sponsoring Ryan to complete a BA Hons degree in Management and Leadership at Nottingham Trent University. 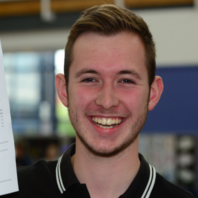 He previously studies Maths, Business and Chemistry A levels at the Joseph Wright Centre. “I am currently working in a sales support role which I love and at the end of my degree I will see where I want my career to take me with the company.I get the opportunity to blend academic learning and work experience where I can convert my learning at University into real business situations. First Response Finance have been involved in the Employer Skills Academies and has now teamed up with Derby College to launch the First Response Business and Finance Academy – offering students at Derby College the chance to follow in Ryan’s footsteps. Find out about studying Apprenticeships at Derby College.